Image caption Lord Browne: "Mistreating any constituent of society eventually leads to collapse"
The former head of BP has said that the relationship between business and society is becoming "dangerous". 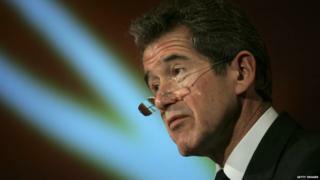 Lord Browne told the BBC business was losing the trust of ordinary people. His latest book sets out how businesses fail to engage with environmental, social and political issues, a failure he thinks could destroy them. And he said labelling these issues as "corporate social responsibility", or CSR, had allowed companies to push them into a "side-pocket". Describing the failure of Enron in 2001 he writes that its CSR "masked a deeply rotten core". "Mistreating any constituent of society eventually leads to collapse," he added. In his book Connect, to be published on Thursday, he describes the rift between society and big business. "Future global development will be constrained... if business is hamstrung by the hate it generates so self-destructively." Talking to BBC business editor Kamal Ahmed, he said: "It is more and more dangerous." "Getting it right is more important now, because the information moves very quickly around the world," he added. "One of the props that people have relied upon is corporate social responsibility, and that's allowed a lot of companies to detach the activity of communicating and being involved with stakeholders almost into a side-pocket,"
In his book, he interviews leading figures such as Facebook's Sheryl Sandberg, Goldman Sachs' Lloyd Blankfein, former UK Prime Minister Tony Blair and Tim Berners-Lee, inventor of the World Wide Web. But he is optimistic that the problems can be solved. He writes: "There has never been a better time to challenge the cycles of anti-business sentiment that have spanned the length of history." He outlines four tenets of what he calls "connected leadership". He believes that businesses have to analyse their stakeholders as precisely as their customers, clearly define their contribution to society, apply world-class management to "soft" social topics and have a commitment to "radical engagement". He writes that the last is perhaps the most important: "It means meeting important stakeholders regularly and making friends before they are needed. And it means communicating to outsiders in clear language without resorting to propaganda."